Design your own Prado tour! Below is an image bank of selected art works, some of which feature in the primary and secondary worksheets developed for the 'Portrait of Spain' exhibition. Choose 6 art works from the image bank to form your own 'Portrait of Spain' tour. Velázquez painted three royal portraits in which the subject was posed in a similar manner against a natural woodland setting. Firstly, Philip IV aged in his early thirties, as we see here; his younger brother, the Cardinal-Infante Ferdinand; and his son and heir, Crown Prince Baltasar Carlos. Originally hung in a royal hunting lodge (with the portrait of the dwarf Francisco Lezcano, seen nearby), the painting's audience would have been courtiers and foreign visitors. This portrait is a clear representation of the power of the King, who in the 1630s was the most powerful monarch in Europe. The painting also reveals Philip's belief that his physical presence was sufficient to declare his kingly status, without the need for symbolic props or lavish ceremonial dress. The ghostly shadows on the canvas are areas where Velázquez has over-painted parts of the composition. Originally, the King held his hat in his hand, his left leg was more frontally positioned, and the barrel of his shotgun was longer. The infanta Isabella Clara Eugenia was Philip II's eldest surviving daughter. In 1598, Philip II renounced his rights to the Spanish Netherlands and ceded this territory to Isabella and her fiancé, Albert VII, Archduke of Austria. From 1601, the couple ruled over the Spanish Netherlands jointly, making Isabella one of the most powerful women in the Habsburg dynasty. Pictured here prior to her departure for Brussels, Isabella wears a breathtaking costume that corresponds to Spanish fashions of the mid to late 1580s, and holds a cameo of her father prominently in her hand. 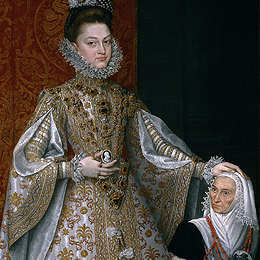 Her kneeling companion, Magdalena Ruiz, had served the Spanish Habsburgs since the reign of Charles V. The presence of the ancient maidservant accentuates Isabella's youthful vigour and majesty. Magdalena's coral necklace (which features a cameo, in imitation of her mistress) and the two monkeys she holds symbolise Spain's imperial power (which had included Portugal since 1580). Typical of the cool elegance of Sánchez Coello's royal portraits, the sitters signify the authority of the institution of monarchy, rather than their nature as individuals. 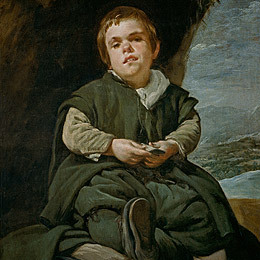 Francisco Lezcano, a dwarf from the Basque country, was in the service of the royal court from 1634 until his death in 1649. He was roughly the same age as Crown Prince Baltasar Carlos, whom he served until the latter's death in 1646. 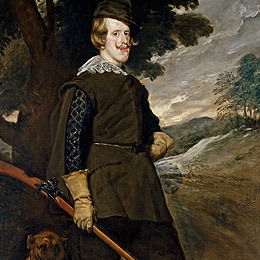 This portrait hung in the Torre de la Parada, the hunting pavilion in the grounds of El Pardo Palace. People with physical or mental disabilities were engaged by the court as 'pleasure-makers' and, in certain cases, also fulfilled administrative duties. An indispensable part of the palace's human landscape, dwarfs and other 'curiosities' provided the entertainment and companionship that other courtiers were unable to; considered no threat to royal power, they were accepted as members of the monarch's inner circle, known as the King's 'family'. In his paintings of dwarfs, bufóns and court jesters, Velázquez was remarkably free and spontaneous in his depiction of facial features and expressions. With the subject seated in an informal manner, displaying an almost insolent attitude unthinkable in a court portrait of any other sitter, Francisco Lezcano is a remarkable demonstration of the artist's willingness to experiment with the conventions of the genre of portraiture. Francisco de Zurbarán trained in Seville and produced numerous religious paintings for its churches, convents and monasteries. Mythological subjects, such as this of the Roman god Hercules, are unusual in his work. In 1634 – and probably at the invitation of Diego Velázquez, whom he knew from Seville – Zurbarán travelled to Madrid to work on the decorations for the Buen Retiro Palace. Hercules and Cerberus is one of ten paintings by Zurbarán depicting the labours of Hercules, and originally hung in the palace's throne room alongside paintings of recent military victories, including Pereda's Relief of Genoa. According to myth, the last of Hercules's twelve labours was to trap Cerberus, the ferocious three-headed dog that guarded the entrance to the classical underworld, Hades. Hercules was also considered the mythical founder of the Habsburg dynasty, and images displaying his courage, loyalty and strength reinforced the message that these virtues were shared by the Spanish monarch, Philip IV. This is Titian's second painting on the subject of Christ's encounter with Simon the Cyrenian on the road to Calvary. The earlier version, which is dated 1560 and also in the Prado's Collection, is the first known painting of this scene, in which Simon helps Christ to carry the Cross. It is likely that Philip II of Spain suggested the subject, the earlier version being a commission for his private chapel in the royal monastery of El Escorial. The inherent prestige of this commission and the success of the powerful composition appear to have inspired this and other renditions. This version has a more direct appeal to the viewer, with Christ's gaze meeting ours directly. 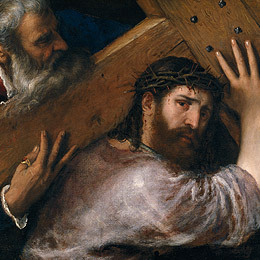 Distinguished by its strong emotional charge, this work is believed to have been commissioned by Francesco Zuccato, Titian's first teacher in Venice and the figure on whom the image of Simon of Cyrene was based. By having himself painted as Simon, Zuccato was visualising his desire to suffer like, and with, Christ, thereby confirming his faith. Here, the figure of Saint Benedict is solidly modelled with heavy impasto and set against a sketchy background. The saint wears the habit of the Benedictine order and holds a bishop's crosier or staff in his left hand. With his right hand he gestures downwards, most likely to the altar's tabernacle, where the bread and wine symbolising the flesh and blood of Christ are held. 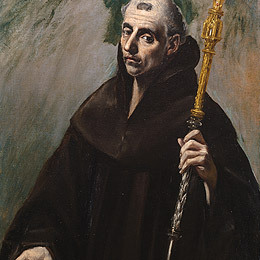 The saint's compassionate expression suggests that we are in the presence of a real man, not an idealised one, which is consistent with the way El Greco chose to depict sanctity. Although Francisco de Zurbarán is known for some remarkable still-life paintings and a few mythological and history paintings, including those painted for the Buen Retiro Palace in 1634, he was not appointed court painter. He was, however, very popular with Church patrons, who felt his imagery was in keeping with the devout religiosity of Seville during the Counter-Reformation, and produced numerous religious paintings for churches, convents and monasteries. 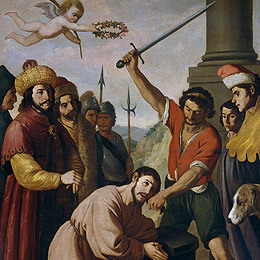 This painting presents a moment before Saint James's execution; a little angel above him holds a crown of flowers and a palm frond, the attributes of martyrdom. It was possibly created for the altar of the Church of Our Lady of Granada in the city of Llerena – Zurbarán had been commissioned for the church's altarpiece in 1636. The rigid monumentality of the figures produces an atmosphere of restrained, silent meditation, making this work uncharacteristic of the seventeenth-century emphasis on the violence and drama of martyrdom. This painting's octagonal format makes it unique in seventeenth-century European art. The unusual shape is a determining factor in it's monumental composition, and was perhaps chosen to accentuate the more lavish and decorative characteristics of the still-life genre illustrated here. 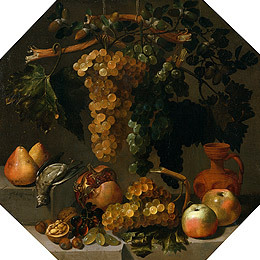 The painting contains features commonly associated with the Spanish still-life tradition, such as the colour palette, the geometrically stepped stone base, locally manufactured earthenware jar and simple foods, but it has an opulence more commonly associated with Flemish and Italian art. The work is also a virtuosic display of painterly skill – the grapes appear almost too real, like glistening jewels made of glass. The bursting pomegranate and the dead bird draped over the stone add a Baroque drama to the composition, making the objects appear more allegorical than literal, reflecting in equal measure the perils and delights of excess. This painting and the one hung adjacent are the earliest known surviving signed works by Valencian artist Tomás Hiepes. Conceived by the artist to be hung together, the works share a symmetrical composition, although within each there are clever diversions from the overall plan. While companion pieces were not uncommon during the seventeenth century, the decorative ceramics in these works distinguish them within the Spanish still-life tradition. Along with the fine lace tablecloths, the decorative bowls – not associated with local production but probably imported from Holland – suggest that the works were made for an affluent middle-class client, most likely a wealthy landowner from the Valencian region. 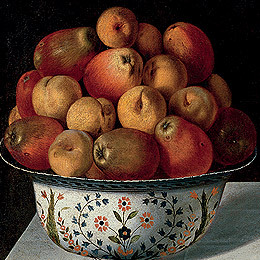 The desire of the newly formed Spanish middle classes to decorate their homes to reflect their aspirations created a consumer market that contributed to the development of still-life painting in Europe. Cacao entered Spain around 1544, when Dominican friars presented the court of Philip II with discoveries from the New World. These discoveries included representatives of the Mayan people (from modern-day Guatemala), who gave Philip the gift of chocolate. Soon it was being enjoyed as a sweetened and spiced hot drink by all levels of Spanish society. 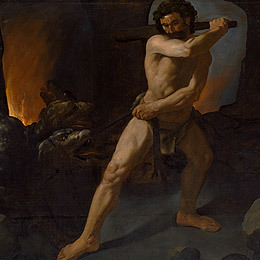 The raw form of chocolate, seen in the painting's lower right corner, was mixed with hot water or milk in the copper chocolatera and whisked with a long-handled implement called a mano. Despite its widespread popularity, the presence of the exotic porcelain cup – Cantonese, perhaps Qing dynasty and exported from China by the Dutch East India Company – suggests that, even in the eighteenth century, the ritual of drinking chocolate could denote social refinement. 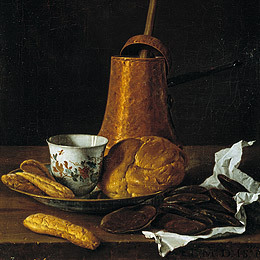 Like the painting adjacent, Still life with chocolate service was commissioned by the Prince of Asturias (later Charles IV) for the Cabinet of Natural History within the Royal Palace in Madrid. Both paintings entered the Museo del Prado in 1819. Part of the same series as The tobacco guards, this tapestry cartoon was commissioned by Charles III to decorate his son and daughter-in-law's private chambers in the royal palace at El Pardo. In keeping with the monarch's intellectual tastes, Goya was asked to represent the contemporary life of Madrid and its surrounding areas. ". 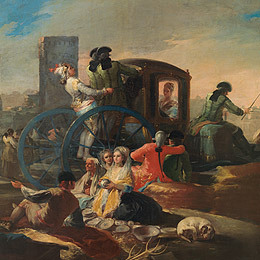 . . a Valencian man selling crockery; two ladies, seated, choosing what to purchase; a seated old woman doing the same; on one side two gentlemen seated on a pile of round mats watching a coach pass by, in the front part of which a lady may be seen inside, with two footmen and another servant riding behind, and a coachman on his driver's seat; further in the distance are various people and buildings." These cartoons were not originally intended for public display, and were kept in a storeroom in Madrid's Royal Palace before entering the Prado in 1870. Like the two paintings by Goya hanging nearby, this painting is a cartoon for a tapestry to decorate the bedchamber of the Prince and Princess of Asturias in the royal palace of El Pardo. José del Castillo joined the group of painters working for the Royal Tapestry Manufactory in 1765 on the initiative of Anton Raphael Mengs. 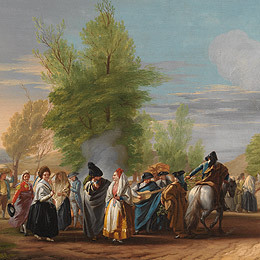 The sketch represents a group of pilgrims celebrating in a field below the hermitage of San Isidro, situated on the outskirts of Madrid. According to legend, Isidore the Labourer (c.1080–1172), Madrid's patron saint, was working in the fields during a drought when he caused a spring to gush forth sufficient water to supply the entire city. The hermitage was built in 1528 on the orders of Empress Isabella of Portugal, wife of Charles V, to commemorate her son's miraculous cure from an illness when given the water from this spring – her son was the future king Philip II. The site remains the destination of pilgrims to this day, celebrated on 15 May, the saint's feast day. In the eighteenth century, newly built royal residences at El Escorial and El Pardo hosted the royal court during autumn and winter. Their walls were hung with tapestries that served the dual function of decoration and insulation. Ramón Bayeu began working for the Royal Tapestry Manufactory in Madrid in 1775, under the direction of his older brother, Francisco. 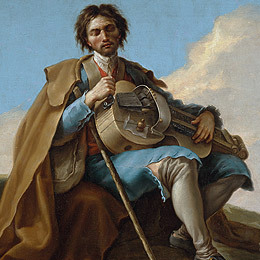 The blind musician belongs to a series of cartoons that Anton Raphael Mengs commissioned from the Bayeu brothers for Charles III. Ramón's painting is considered the most beautiful of the series. Here, two itinerant buskers perform with a small dog, a subject with a long tradition in Spanish art and folkloric charm. However, the fact that a tapestry based on this image of social hardship would eventually adorn the walls of a royal residence illustrates the conflicting social ideologies promoted by Mengs in his service to Charles III. María Antonia Gonzaga y Caracciolo (1735–1801), Marchioness of Villafranca, belonged to the highest nobility as the daughter of Francisco Gonzaga, Prince of the Holy Roman Empire and Duke of Solferino. She married Antonio Álvarez de Toledo, the tenth Marquis of Villafranca and a grandee of Spain. Their son, the eleventh Marquis of Villafranca, became the Duke of Alba on his marriage to María Teresa de Silva, the Duchess of Alba, whom Goya also famously painted. The mother of five children, the Marchioness of Villafranca was widowed quite young. Rather than remarrying, as would have been typical in that era, she devoted herself to the care of her children and to the administration of the marquisate. 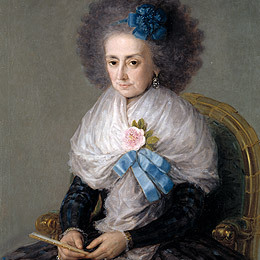 Her elegant dress reflects the French-influenced styles then in fashion and includes typical feminine adornments of the time, such as the blue silk cockade she wears in her large powdered wig, the rose brooch, and blue ribbon tied around her white shawl. This portrait was bequeathed to the Museo del Prado in 1898 by the marchioness's descendants. 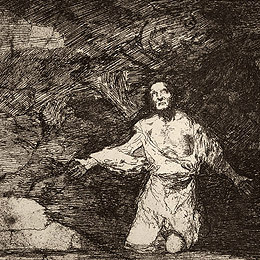 As its title would suggest, Sad forebodings of what is going to happen is the first plate from Goya's eloquent and disturbing series The Disasters of War. This print is a prologue to the series, symbolising the physical and emotional destruction of humanity in the theatre of war. To express this concept, Goya has secularised the iconography of Christ's Agony in the Garden, situating it in a context that offers no hope of redemption. Just as Diego Velázquez was a seventeenth-century artist whose works were revered and emulated by painters in the nineteenth century, Miguel de Cervantes was a literary master whose works inspired artists and writers alike in their exploration of Spanish cultural identity. 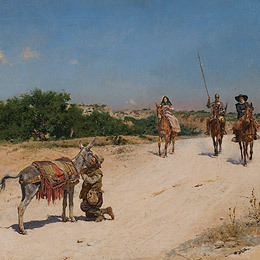 Towards the end of the nineteenth century, the characters of Don Quixote and his squire, Sancho Panza, could be seen as embodying a 'Spanish' way of being. 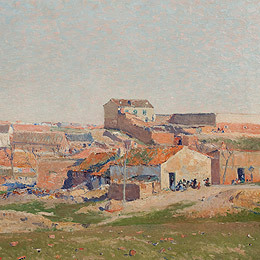 Like the French impressionists, Aureliano de Beruete sought to capture in his landscapes the qualities of light and colour that uniquely characterised the Castile region. His interest in regional specificity aligned him with the Generation of 1898, a group of writers and artists concerned with Spain's cultural identity and position in the modern world. In the late 1800s, the outskirts of Madrid underwent significant transformation due to the city's population growth. Bellas Vistas was a new community on the city's western edge, with ramshackle dwellings inhabited by rag-and-bone merchants and brickmakers. The ironically named Bellas Vistas (meaning 'beautiful views') was the type of fringe community where Pío Baroja set his 1904 trilogy La lucha por la vida (The struggle for life), which realistically portrayed life in Madrid's slums. Here, Beruete creates a harmony between the built and the natural environment, lending this rough urban landscape a genuine beauty. 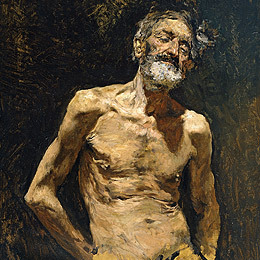 This late study by Mariano Fortuny was painted in Granada, Andalucía. The region's bright sunlight is as much the subject as the old man's flesh it illuminates. One of a series, it was completed outdoors in a loose, painterly style, in which atmosphere and light play a greater role than verisimilitude. Fortuny enjoyed considerable success among foreign collectors during his lifetime, which coincided with the increased recognition of historical Spanish painting in Europe and abroad, and the persistence of a Spanish 'school' of painting. This work pays particular homage to the harsh tenebrism of Jusepe de Ribera, whose paintings of saints were characterised by dark backgrounds and dramatic illumination of the figure. Fortuny was familiar with Ribera's work and had copied his Saint Andrew, seen adjacent, on previous occasions. The identity of the sitter for this painting is unknown. Some speculate that he was a soldier – his helmet is like those worn by the infantry regiments called the tercios; others that he was a bufón employed in the court. He lacks the youth and vigour we might expect of Mars, the Roman god of war, whom he is cast to portray. Using colour rather than line, with free and generous brushwork producing diffuse outlines, Velázquez has painted a surprisingly dishevelled Mars. His melancholy expression, shaded by his helmet, is difficult to read. 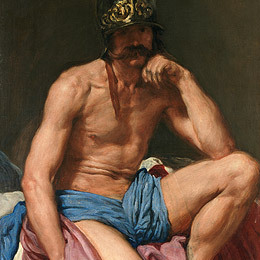 Mars's dejection could be interpreted through the myth in which he is caught in flagrante with Venus by her husband, Vulcan – the blacksmith god – and is humiliated by the loss of his lover; or perhaps he is the personification of a war-weary Spain, only three years into the Franco–Spanish War that would ultimately result in its defeat. All images © Photographic Archive, Museo Nacional del Prado, Madrid. All art works © the Museo Nacional del Prado, Madrid.